Lets get it said immediately. Joseph Kosinski (Tron Legacy) loves Andrey Tarkovskiy – the Russian director of Solaris, Mirror and Stalker and many other movies. Tarkovskiy movies are an acquired taste – ponderous, languid stuff and you need to be patient as the story unfolds, or not. But equally he was arresting and provided deep character studies at a time when all we ever wanted to see was action. (We still do I guess). Oblivion then is a bit of a risk. Stylish, the setting and all the hi-tech stuff is done particularly well. Earth is a ruin. The moon destroyed by an invading power. Earth was consequently devastated by quakes and billions that survived the nuclear explosions quickly starved to death. Those who could, fled to Titan, one of Saturn’s moons and now huge machines are sucking the remaining oceans dry to provide power for those who left. One falls in love with the minimalist ultra tech apartment in the sky, the suspended swimming pool (which would need to be warm being that high up I would have thought). Viki’s (Andrea Riseborough) electronic work desk is one that will have any geek envious for life I should think. Jack (Tom Cruise) has it good. A workmate assigned to him that also sleeps with him – they are a good effective team. His job to go down to Earth each day and maintain the drones is dangerous; because alien scavengers are trying to steal the power cells from the drones. To what end, Jack has no idea. He just knows he has to fix ‘em and report problems. Vicki back up there at the control desk is watching out for him, but she doesn’t share Jacks sense of adventure. Her memory wipe before they took the job has left her quite content to just live in the moment. They are just two weeks away from completing their five-year assignment and then they will go to Titan. She doesn’t want to jeopardise that. Jack has a secret however. He goes off grid from time to time to a secret location where he has built a log cabin by a lake and filled it with all kinds of memorabilia from the destroyed earth. Possibly because he is haunted by dreams of a previous life, a women who calls out to him in his dreams. The memory wipe clearly wasn’t so effective in Tek 49. Here, by the lake and the pine trees he is at peace. Kosinski takes his time setting up the scene, playing with the amazing machines (the aircraft Jack flies is superb and incredibly detailed) and showing us Jack’s daily life. Jack isn’t afraid because he knows the drones are there to save him if the aliens try to grab him, but he does take risks and lays himself open to danger. When one drone disappears down a hole, he tries to find it, only to discover it’s a trap and he’s nearly captured. Clearly the aliens want him. He has no idea why.Then one day an old spaceship from before the invasion crashes to earth, with survivors on board protected by their space life support pods. Jack goes to investigate, despite being told to stand down and he discovers the drones are killing the human survivors. He saves one. He thinks it’s the woman from his dreams standing atop the Empire State building in New York. But that is impossible. The introduction of a beautiful rival for Jack's affections eats away at Viki. It is bound to change the dynamics of the situation. Tom Cruise delivers a nicely measured performance of a man re-discovering his humanity. Andrea Riseborough is dutifully annoying perhaps in an unsympathic role and Olga Kurylenko provides the eye-candy. Many parts seem underwritten (Morgan Freeman in particular who looks well for a man supposed to be over a hundred). The dialogue needed more crackle and world-wariness, but then words are not really what Kosinski was going for. This is about surface, the look and feel of a future as found in Elle Decor perhaps. I am not sure the critics will be kind. The pace certainly lagged in places but Tarkovskiy would have approved I think. There are issues that needed further exploration, but nothing I can say without giving the plot away. 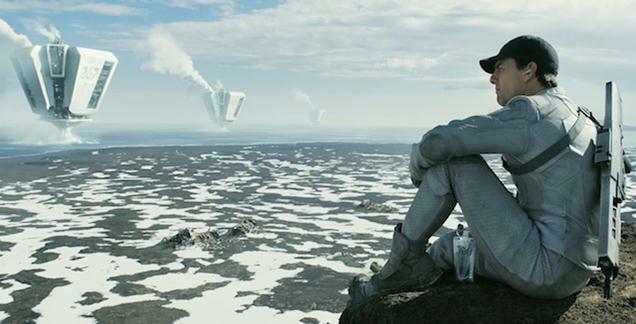 Best to savour this as the most beautiful sci-fi movie you have seen in a long while. (The Icelandic Tourist Board will be waiting for you to visit this summer ). 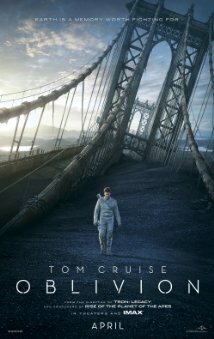 Oblivion is a thinking persons sci-fi movie, stylish, stunning to look at and the soundtrack by Joseph Trapanese is probably worth a listen without the explosions. Discover it for yourself.